I took a poll a few months ago about what color I should paint my front doors. They were raw wood when I moved in which was much too dark for my covered porch. I painted them white but it just looked dirty in this dusty Arizona town so I settled on mustard yellow and loved it. When DecoArt’s new line of outdoor paint came out, we painted them coral just for fun but I sure missed my yellow. I let y’all decide on navy and never loved in. In fact, I didn’t even like them. BUT it was fall and it was fine for Thanksgiving. Now that Christmas is here, I painted them a cherry red for long-lasting holiday cheer! I love how they turned out!!! 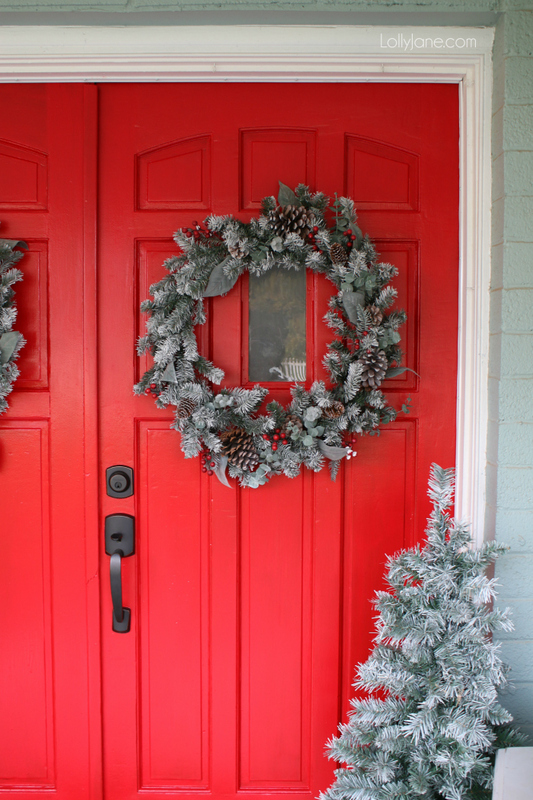 They match my front porch Christmas decor perfectly, don’t you think? 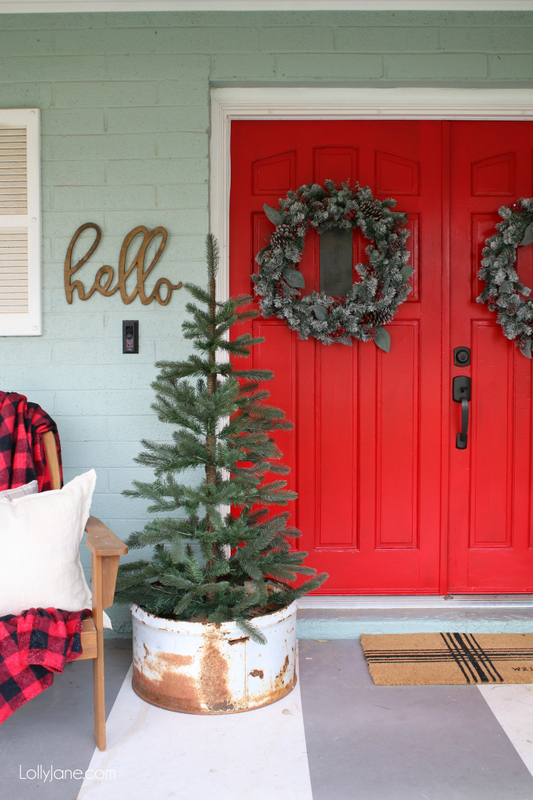 Enjoy a tour of my front porch then head to some more blogger’s decked out outdoor spaces for lots of holiday inspiration! Confession: I love one of the houses in Agritopa neighborhood that’s painted a fun aqua blue with cherry red doors and shutters. When I was choosing my own exterior paint color, I was drawn to aqua over and over. I was all set to copy the red/aqua combo but was so in love with the perfect mustard yellow paint from my great grandmother’s painted buffet that I talked myself into yellow doors with white trim. 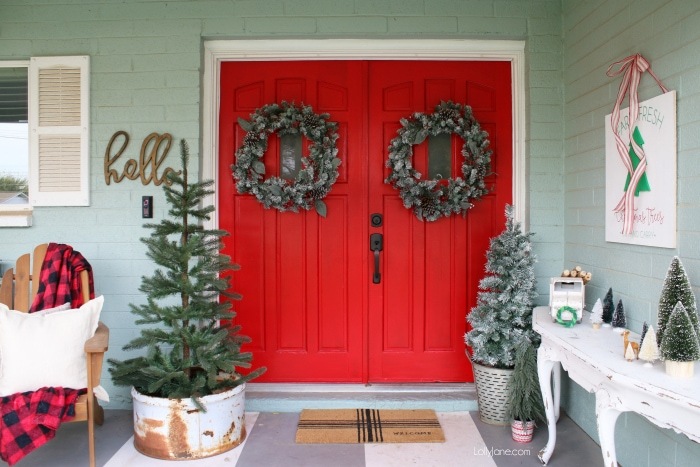 I’m glad I’ve been able to see what red looks like..who knows if I’ll keep it once the new doors arrive but I’m sure loving how the cheery cherry doors are looking for the holidays! I love how bold it is! Red really is a great year-round color. 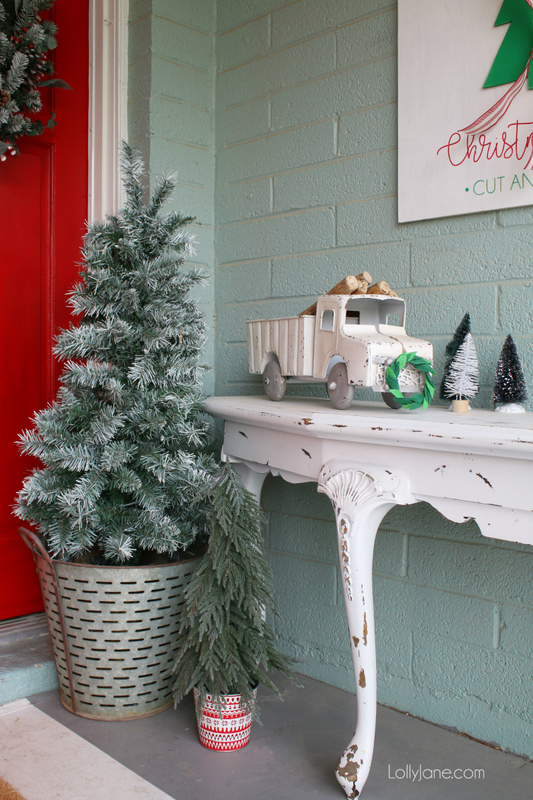 I scored this old bucket + simple tree from a cute store in downtown Mesa called Old Brick House. It has a lot of unique, found items. The plaid welcome mat is the latest from Hearth & Home at Target, Joanna’s new decor line. The olive buckets are from World Market, I’ve linked similar ones here. 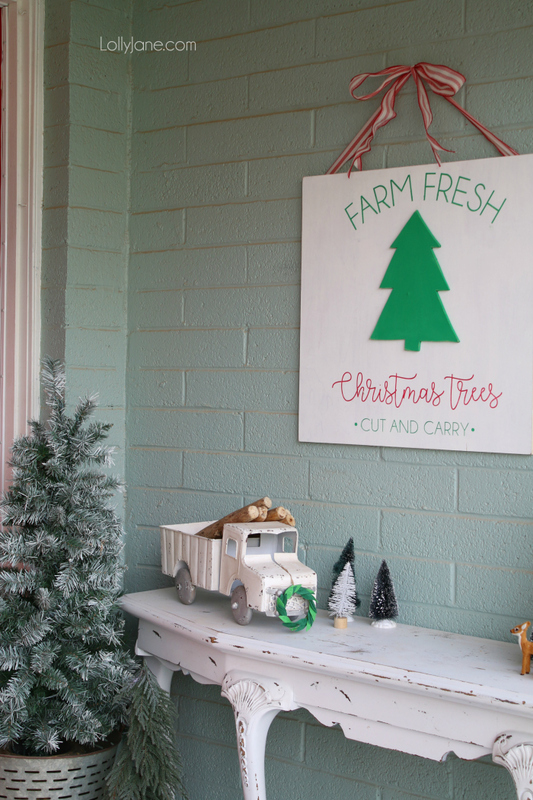 We have a tutorial coming for this fun Farm Fresh Christmas tree sign…we even have a video on how to make it! Now go check out all of our friend’s ideas, so much inspiration, wowzas! SOURCE LIST *note: I did my best to link, I’ve sourced similar products if mine were unavailable. 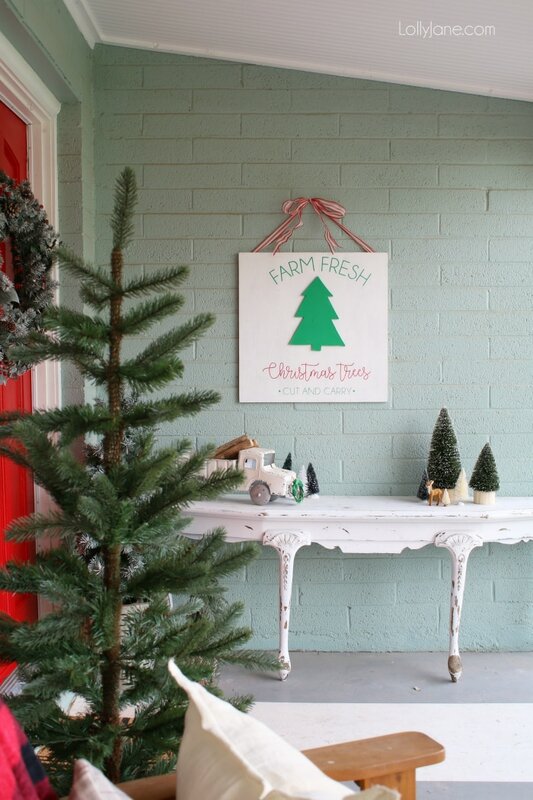 Visit last year’s farmhouse Christmas porch decor too! hey girl- love the doors! so pretty! 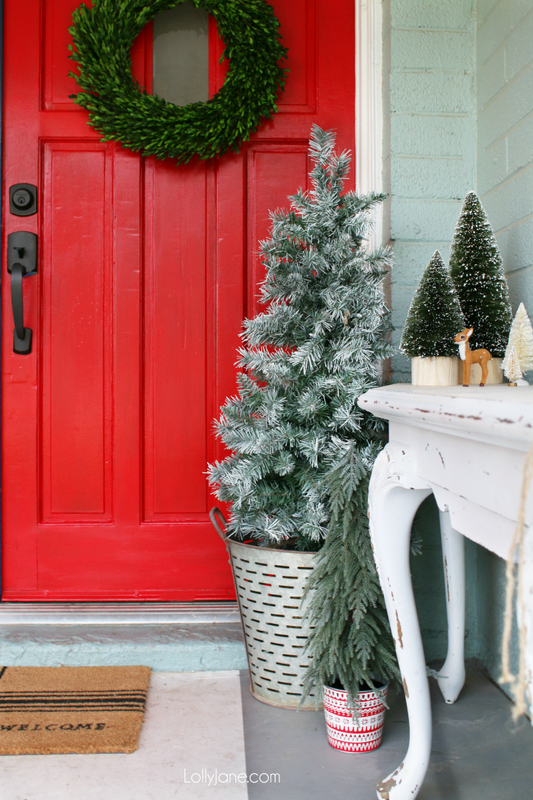 My opinion has ALWAYS been-“You can never go wrong with a red door! No matter what shade of red.” I love it! I just painted mine a sage green to match my dark red brick and hunter shutters. It looks great but I do miss my dark red door. 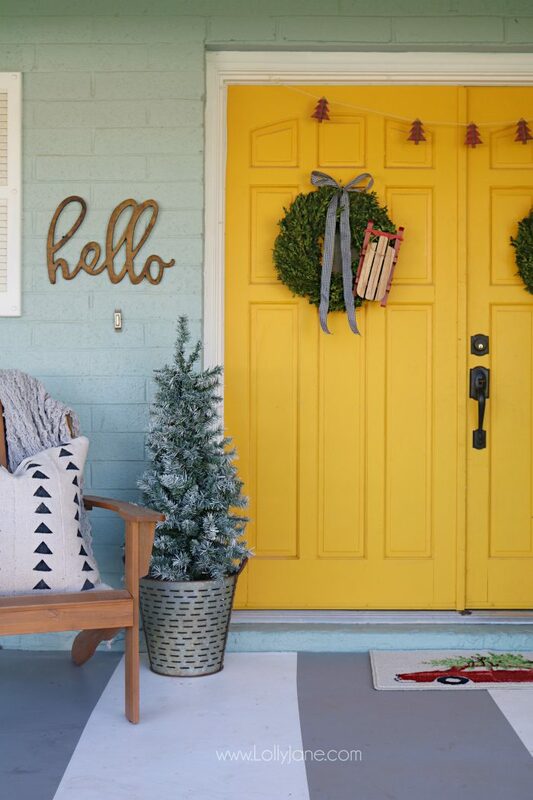 I love everything about your front porch! The red door are so festive! I recently painted mine yellow and love it!! I love the red doors! They are perfect with your holiday porch decor. 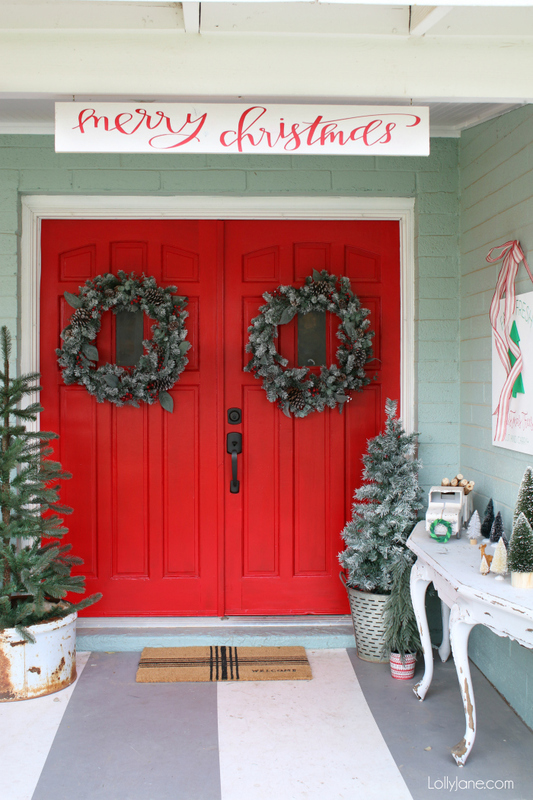 I’ve included your cheery porch on a holiday front door roundup. Thanks for sharing on MM. You really rock front porch decor!! I love all of your ideas from the wreaths to the buckets to the cute vintage truck and tree vignettes on the right side – it all works so beautifully together. And those red doors are the icing on the cake. Love! The red just looks so gorgeous…keep it through Valentines day for SURE!